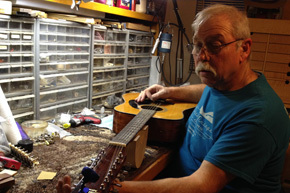 Repairs for most stringed musical instruments, specializing in guitars. Everything from minor setup and adjustment to major fretwork and custom fabrication of parts. We will build a custom guitar to your exact specifications. What you want and just the way you want it.